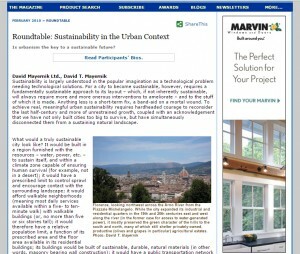 Roundtable: Sustainability in the Urban Context – Is urbanism the key to a sustainable future? For more than two decades the work of our firm, Duany Plater-Zyberk & Company (DPZ), has gained renown as a counter-proposal to suburban sprawl. While recognized for an emphasis on place making and for outperforming conventional suburbia, DPZ’s urbanism is less known for advancing the principles and techniques of sustainable planning. Beginning with Seaside in the early ’80s, DPZ employed green practices long before they were required by legislation or were fashionable in the media, including light infrastructure and innovative storm water-management. More complex environmental projects eventually followed – regional plans, urban infill and suburban redevelopments.